The debate panel discuss the topic of big fish rigs, does such a thing exist? Simon Crow talks about creating an edge with the use of bait while Ellis Brazier solves the rig puzzle and we go live in session with Adam Penning. 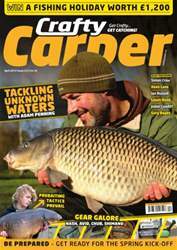 There are tackle and bait reviews galore featuring some of the latest products on the market and we've got an enormous competition thanks to Scarper Carper as one lucky reader will win a £1,200 carp fishing holiday to France.